A still from DEEP VR. Photo by Cinekid. These virtual reality projects will enhance the connection between your body and mind—and leave you exhilarated. This deeply meditative and thrillingly psychoactive VR journey from co-creators Owen Harris and Niki Smit is wholly controlled by the user’s breathing. Players wander through a beautifully immersive underwater seascape that's at once soothing and surprising, compelling us to comfortably question the ways in which our body and mind can work in union, free of stress or anxiety. Deep VR will make its North American premiere at Tribeca as part of Storyscapes. Things aren't quite what they seem in this enchantingly surrealist, real-time CG VR experience from creators Oscar Raby and Shelley Silas, in collaboration with the BBC. In a magical forest, a young boy stares into the eyes of a fantastical creature; together, the two embark on a journey that transports the player into an entrancing realm that weds folkish dimension with boundless imagination. A fairy tale adventure reminiscent of and inspired by Where the Wild Things Are, The Neverending Story, In the Night Garden, and Gustav Klimt's technically intricate and impeccably colored paintings, The Turning Forest achieves an advanced level of enveloping binaural sound and a key visual element of camouflage, or, as Raby puts it, “an invisibility that, when achieved, can turn threat into safety.” The Turning Forest allows viewers of all ages to enter the sort of mystical world that adult dreamers fancied in their youth, drawing users into its bewitching atmosphere, and, more importantly, a purely fulfilled and long-forgotten state of childlike imagination. The Turning Forest will make its world premiere at Tribeca as part of Storyscapes. The debut project from VR studio Blackthorn Media, Dragonflight is an artful thrill-ride of an action-adventure that lets players embark on a heroic journey that's the stuff of mythical fantasy. Wage battle against a duplicitous sorcerer! Protect the world from the second coming of his ancient yet powerful progenitor! Best of all, do it on the back of a spectacular dragon, created by an all-star, multi-award-winning special effects team who have enabled their project to simulate the actual and exhilarating feeling of flight. Dragonflight will make its world premiere at Tribeca as part of the Virtual Arcade. 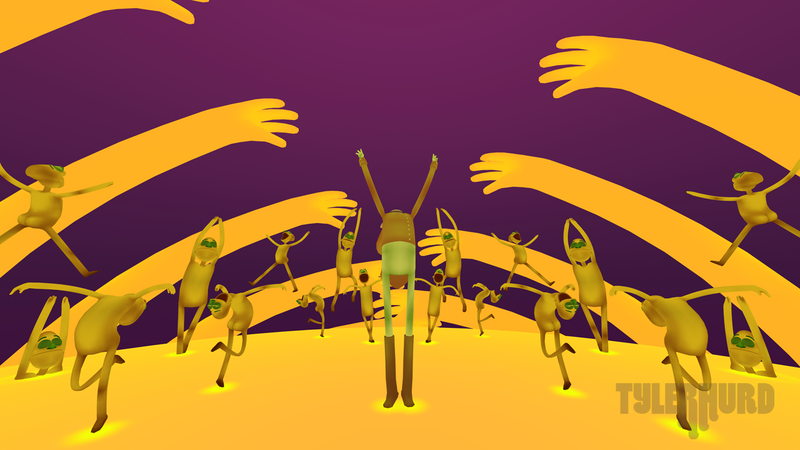 We dare you not to dance when you tap into Old Friend, which turns the standard virtual reality experience into a vibrant, all-out dance party that’s joyfully, psychedelically insane. VR filmmaker Tyler Hurd and VR outfit WEVR use fun animations to present a thrillingly immersive music video experience set to Future Islands’ "Old Friend," which scores elegant, monkey-performed dance routines that soon transpire into blissfully unhinged chaotic movement. Inspired, as Hurd puts it, by “friends, marching bands, Jim Henson, synchronized swimming, Rockettes, zoetropes," and the animations of Jim Woodring and John Kricfalusi, Old Friend is a knowingly ridiculous diversion that giddily verges on the absurd. Sure, everyone's watching, but Old Friend is too irresistible to make one stay still. Leave your qualms at the door and your heart on the dance floor. Old Friend will make its U.S. Premiere at Tribeca as part of the Virtual Arcade. Intrigued by virtual reality? Click here to learn about all of the VR and innovation projects that will be at the 2016 Tribeca Film Festival, taking place April 13th to the 24th.